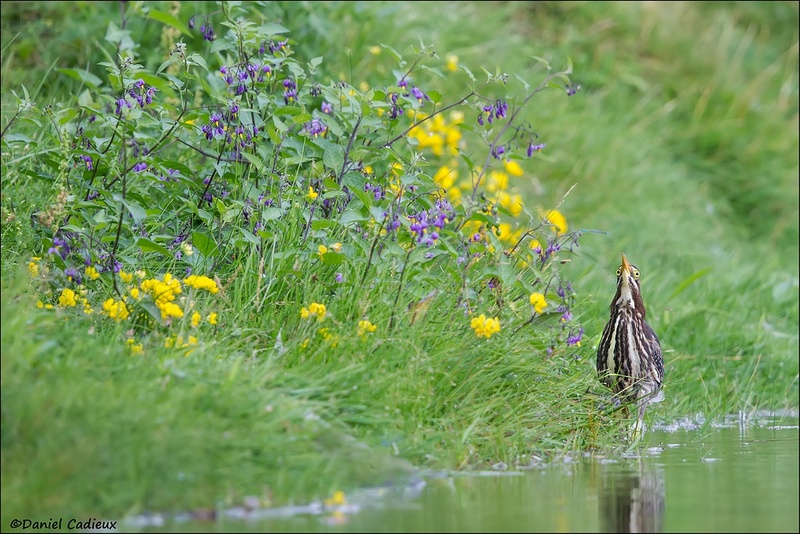 Most of us are the same when photographing birds: we want to get as close as possible to our subjects. Either physically, or with the help of long lenses (or both), we want to fill the frame and offer the best possible details to the feathers. This is fine most of the time, especially with well-balance compositions, and with tight and graphic “head-and-shoulders” portraits which I am a fan of. These images usually have well focused and sharp subjects set against smoothly blurred distant backgrounds. Most of my images go into this category. One negative aspect of this style is that apart from small clues (from a leafy identifiable perch, or sandy floor with a shell, for example), this offers no major hint of habitat, of where the subject lives or likes to hang out. When the habitat is beautiful, it is wise to look for opportunities to include it in your image, with the subject small, or even very small, within it. This gives the viewer instant recognition of what type of habitat the bird was found in. 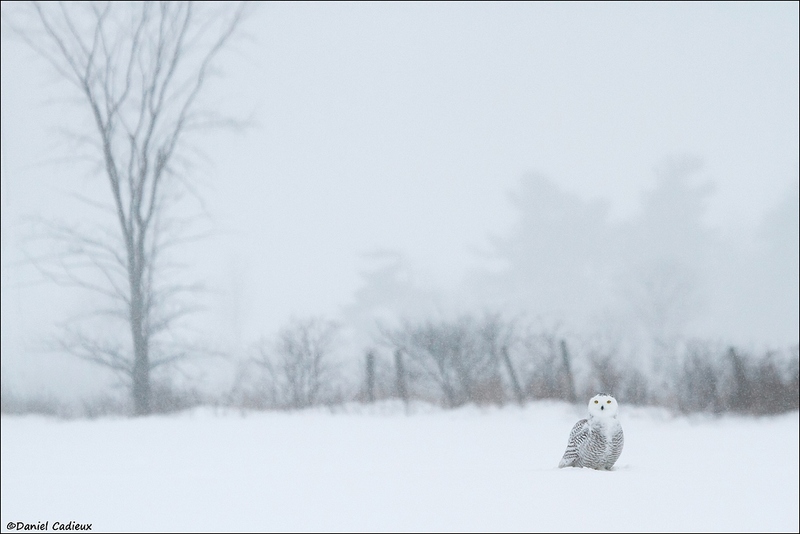 Snowy Owl near farmer’s field, Canon 7D + 100-400L lens @260mm, manual exposure, evaluative metering, 1/250s., f/6.3, ISO 1600. With small in the frame subjects, it is doubly important to pay particular attention to the background, and where the elements fall. In the image above, the large background tree was deliberately placed in the upper left corner to offer balance to the composition with the owl in lower right. Also to watch out for in this case was to move left or right to avoid having a fence post growing out and above the owl’s head. Taking a step or two to my left made sure that near post was not touching any part of the subject. A small-in-the-frame strategy offers an advantage with skittish subjects, or smaller tough-to-get-close-to birds: you can simply photograph them from further away or with a smaller lens. When this Grasshopper Sparrow sang from a dried up milkweed sticking out of newer fresh ones, I photographed it right away in its grasslands surroundings before attempting to get closer. 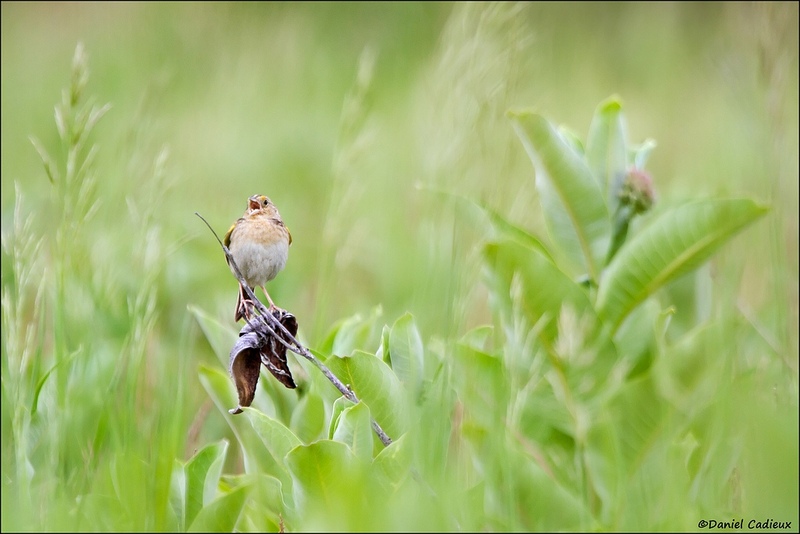 Grasshopper Sparrow in grasslands, Canon 7D + 100-400L @400mm, manual exposure, evaluative metering, 1/400s., f/6.3, ISO 800. Note again the deliberate placement of elements in the frame. The larger milkweed at right offering balance to the subject at left, as well as leaving some spacing around the taller grass stalk at upper left corner. Going vertical is a great way to show beautiful habitat or taking advantage of appealing colours, especially when extending above the subject. 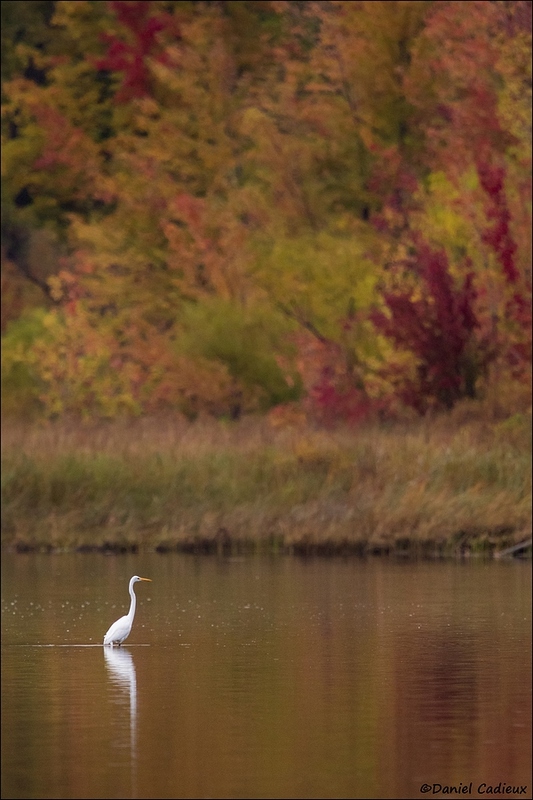 By placing a distant egret in a low corner, this let the autumnal treeline dominate the canvas with its warm and vivid hues. Although 95% of the frame is wall-to-wall fall colouring, the small-in-the-frame Great Egret remains a strong anchoring point and main the focus point of the image. Great Egret along river shore, Canon 7DII + 500mm f/4 II + 1.4TC III, manual exposure, evaluative metering, 1/320s., f/5.6, ISO 1600. Going horizontal with the egret image would not have resulted in such a dramatic output, and pointing the lens to the left would have kept the burgundy tree out of the frame – again putting the emphasis on being on the lookout for interesting background elements (and their placement) when creating these types of images. Take note of most of the subject placements in this blog post. It is very rare that subjects placed in the center, or close to it, works well with these types of images. Three of the four images has the bird placed in a corner. This is the preferred subject placement when it is small. The sparrow is up higher, but the surroundings balance things out. I have rarely seen a fully centered composition work with small-in-the-frame, but rules are made to be broken – just make sure to have a good reason to do so. Another plus when making the subject small in the frame is to put its’ size in perspective. Most people who have not seen a Green Heron before may think it is a large bird such as a Great Blue Heron or any of the egrets, or most of the other waders. Green Heron at edge of pond, Canon 7D + 500mm f/4 II + 1.4TC III, manual exposure, evaluative metering, 1/800s., f/5.6, ISO 800. Photographing this individual small in the frame, next to some flowering “weeds”, really emphasized the diminutive stature of this species. One last main reason to create small-in-the-frame images is simply to diversify your portfolio. It is really satisfying to look at a species folder and see all types of images of it: classic “textbook” frames, tight portraits, action images…and of course, small in the frame. Plus, as an added bonus, it really gets the creative juices flowing and helps keep interest high in photographing species that are often encountered! These are wonderful tips and ones the I will file away and put to use in the future. Beautiful images. I particularly like the egret and the snowy owl. Love your work. Thank you very much Holly! I am glad you were able to take something out of it. The one with the Great Egret has the added feature of having the bird walking into the frame. Hey Rich, thank you for the compliment. Glad you like the images!